Trick or treating was like, a mega big deal for me. My friends and I took it pretty seriously. We used pillow cases to carry our candy because none of the cutesy little buckets were large enough for our haul. We weighed our loot at the end of the evening – I believe once I had nearly 10 pounds! When we all got home, my brothers and I would set out our candy and begin the very serious business of candy trading. I would divide my candy into categories – mini candy bars,the few good fruity candies (Starburst, Nerds, etc. ), the gummy types (Dots, Mike and Ikes, and other yucks), and always that sorry miscellaneous pile that includes the mysterious black-and-orange wrapped awful chewy things. Once in categories, I then divided things up further into even stacks of each individual type of candy. When I was younger I weirdly did not like Reese cups, and those were as good as money in the candy trade. One of my favorite things to trade for? Butterfingers, baby. 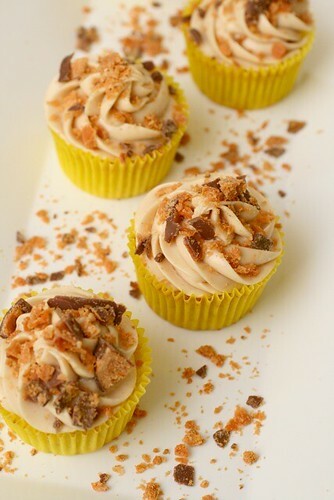 When my fabulous friend and coworker Shanon mentioned Butterfinger as a potential cupcake flavor for her birthday, I was all over it. 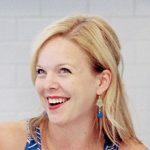 I browsed a few ideas around the interwebs but nothing struck me as “the one”. I knew that I definitely wanted the candy bar to be the shining star here, with the cake and frosting complimenting but not overpowering it. I toyed with the idea of chopping up the bars and adding them to the cake batter, but then they would lose crispiness which is one of the best things about Butterfingers. Eventually I opted for a banana cupcake base since banana and peanut butter are such a classic pair. (I think they would also be good with a basic vanilla cupcake base.) 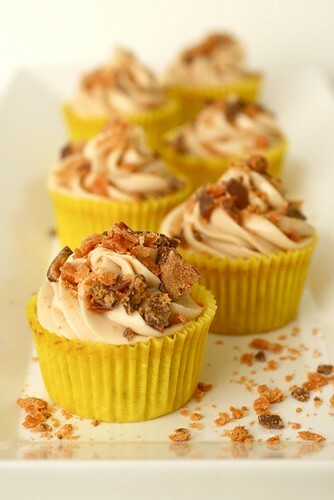 These particular cupcakes bake up with flat tops, so I cut fun-size Butterfinger bars in half and placed one half on top of each cupcake. Then I covered them with my favorite peanut butter frosting (ohmygoshiloveit) and finished off with more crumbled candy bars. The result was perfect. I absolutely loved the surprise of the candy bar hiding under the frosting, and the overall balance of the flavors was just right with Butterfingers as the star. I hope someone asks for them again soon! Note: Some of the measurements in the cupcake recipe may seem a bit odd, but I made a 2/3 batch of my favorite banana cupcakes which made for some funny math. But, it also made the exact number of cupcakes I wanted (24). If this bothers you, make the full recipe as in the link above with additional frosting and extra candy bars. To make the cupcakes, preheat the oven to 350° F. Line cupcake pans with paper liners. In a medium bowl combine the flour, baking powder and salt; whisk together and set aside. In the bowl of a stand mixer fitted with the paddle attachment cream together the butter and sugar on medium-high speed until light and fluffy, about 2 minutes. Reduce the mixer speed to medium low and add in eggs one at a time, scraping down the sides of the bowl as needed. Mix in the mashed banana until well combined. With the mixer on low speed alternately add the dry ingredients and buttermilk, beginning and ending with the dry ingredients and mixing only until just incorporated. To make the frosting, in the bowl of an electric mixer fitted with the paddle attachment, combine the cream cheese, butter and peanut butter until smooth. Slowly mix in the confectioners’ sugar, beating until smooth and well blended. Mix in the whipped topping until smooth and fluffy. To assemble the cupcakes, place a candy bar half on top of each cooled cupcake. Transfer the frosting to a pastry bag fitted with a decorative tip and pipe onto the cupcakes, covering the candy bar completely. (I used a large, unlabeled star tip to frost these cupcakes.) Sprinkle with chopped candy bars for garnish.